When I was in high school we had a shooting war going on in Korea. Having registered for the draft brought this into sharp focus for me. 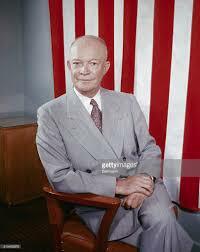 But before my time ran out and the draft board sent me their invitation Ike came along campaigning for president. The big promise he made was: “If you elect me as your president I’ll bring your boys home from Korea.” Of course, I wasn’t old enough to vote, but those words certainly won my support. I had no desire to spend the rest of my life on Pork Chop Hill. Ike went on to become our president and his campaign commitment became a reality. The details holding the agreement together weren’t perfect, but they certain were better than the shooting war that had already claimed 58,000 American lives. During the two previous administrations, perhaps more, the agreement has become frayed. And during the final years of Obama’s administration it became a dangerous situation. Then along came Trump, the self-proclaimed Master Negotiator. Trump needs to realize he can’t fire everybody who disagrees with him. He needs to curtail his petty Tweeting, stop his street-fighting and defuse this situation. Here’s his chance to show his stuff. Yes, he can’t fire everybody who disagrees with him.